Squeeze formed in 1974, shortly after teenage friends Chris Difford and Glenn Tilbrook began their songwriting partnership, brought together by an ad in a sweetshop window. By 1977 they had made their recording debut and enjoyed a string of hits that lasted until 1982. Over the years there have been solo careers and occasional separations, but the Ivor Novello Award-winning songwriting duo got back together in 2007 to relaunch Squeeze. Cradle to the Grave is the band’s latest and 14th studio album. It features the first collection of new songs from Difford and Tilbrook since 1998. 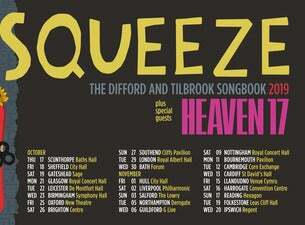 Squeeze are touring the UK in 2017 with their Join the Dots tour.